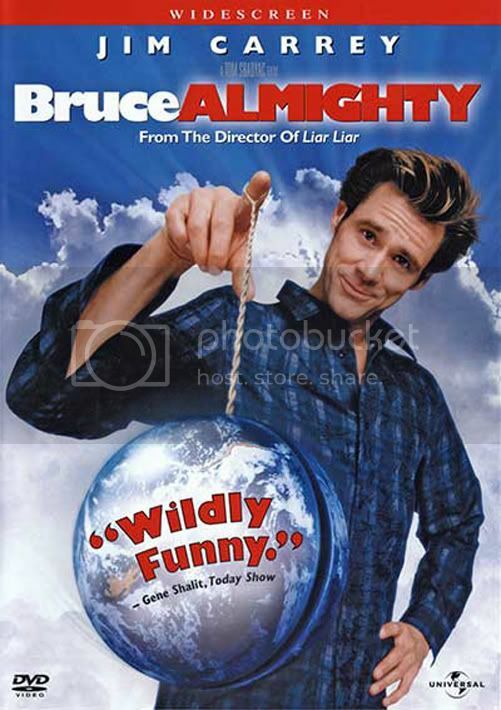 Buy, Rent or Skip Bruce ALMIGHTY? Bruce ALMIGHTY is a good movie. It's just not a great Jim Carrey movie. It has a good story and it's one the whole family can watch. But the part really could have been played by anyone and gotten the same results. I think the movie relying too much on sight gags and props to get most of the laughs kind of diminishes what Jim brings to most of his films. He is a goldmine of ad-lib and improv and when he nails it, those are the biggest and best laughs. But in this one, there really wasn't any of that spontaneous humor. I looooooove Jennifer Aniston, but her role in this one is typical of her entire film career, which is very sad. I just don't understand why she continues to go down this road of playing the same character over and over. It sounds like I'm bashing the movie, I'm not. Like I said, it's good. But it could have been so much better. What does it say about not using Jim properly in this one when the best comedic moment came from Steve Carell. Very funny moment for sure. It was good enough to net him the sequel. Even though I own it, this one really isn't more than a Rent. If you are looking for other Divine Intervention films that are 10 Star worthy flicks, you can't go wrong with Oh, God! with George Burns and John Denver and Heaven Can Wait with Warren Beatty and James Mason.